Who really brought about the apocalypse? And where's the Coven? Going into Episode 2, tons of questions remain about the settings, characters, and storyline this season — and the internet is chock full of theories on what’s to come. After all, what better way to pass the time during the week between episodes than to discuss your ideas with fellow fans on various AHS online forums? First, a quick recap. In the premiere of American Horror Story Season 8 the world ended. Sure, some people survived, but the season’s title, Apocalypse, definitely lived up to its name when most of the planet was destroyed by missiles in the first few minutes of Episode 1. Some of the survivors ended up camping out in a containment facility run by a government organization under the control of Kathy Bates’ and Sarah Paulson’s characters, but their future looks bleak. Then, in walks Michael Langdon, who is almost definitely the Antichrist. He arrives at the facility and tells Bates’ character there’s another outpost like her’s, offering the taken the entire group there. But first, he has to determine who’s worthy of being rescued, which probably won’t end well for at least some of the survivors. Some of the theories about the American Horror Story Season 8 involve Langdon directly, and since he’s been positioned as such an important figure (the Antichrist is generally a pretty big deal in most end of the world stories), he will likely be a big influence over a lot of events in AHS: Apocalypse. So let’s take a look at a few of the theories fans have dreamed up so far. From the very first episode of the season, AHS viewers know that the world has essentially “ended” in missile fire and almost total destruction. What we don’t really know yet is who launched the missiles or why they were sent out in the first place. Some fans believe the Cooperative, the government group housing survivors, is responsible for the launches. Maybe the cooperative had agents in major world governments and organizations. People thought it was countries fighting against each other, but it was really the cooperative pretending to fight itself. Still others think it may have been the Antichrist himself “so he could form the earth in his vision,” one Reddit user, Lux-xxv, theorized. But my favorite theory is that, regardless of who was actually responsible for the apocalypse, the newscaster from Episode 1 was in on it too. During his final broadcast, he clearly says, “I can’t believe we did it.” He may have just been speaking out of disbelief that the world really went through with launching nukes, but it would also be very clever to have a hint like that hidden in the premiere episode. Fans are extremely anxious for the witches from American Horror Story: Coven to show up. This new AHS story is supposed to be a crossover between Coven and Murder House, but so far, the witches are not present at the end of the world. However, a few of them do pop up in the teaser trailer for Episode 2. 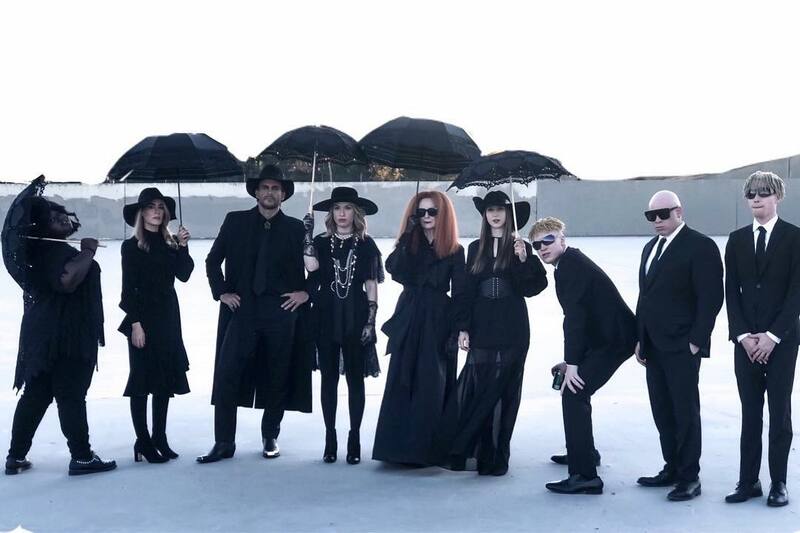 And if a photo posted to Reddit is to be believed, the Coven may get a new member — if not multiple — during the Apocalypse season of AHS. The photo, seen above, makes it look like Coco, a character from the premiere episode, may be in the Coven now. “I hope this means Coco is a witch,” Redditor General Stanton replied. In the same thread, Reddit user dreammkushh responded, “I read that coco is related to Madison. So I feel like you’re correct,” likely referring to Madison Montgomery from Coven. There’s always a chance that Leslie Grossman is playing someone other than Coco in that photo, especially because American Horror Story has actors play other characters all the time. But a favorite fan theory seems to be that Coco gets to be a witch later on in the season. What crossovers can we expect? Fans also have thoughts about how Apocalypse will play around with crossovers of other American Horror Story seasons. On Twitter, Chloe Carney suggested that the entire show universe could be combined before the end of the Season 8, for instance. We already know Murder House and Coven clues will be involved, but there are a lot of other AHS seasons that Ryan Murphy could crossover with this one as well. Maybe some of these theories will be proven correct in the second episode of American Horror Story: Apocalypse. Or maybe everyone is wrong, and AHS Season 8 even more surprises up their sleeves.